Creating a beautiful landscape isn’t as hard as you might think. Follow these flower garden design tips for your own yard. 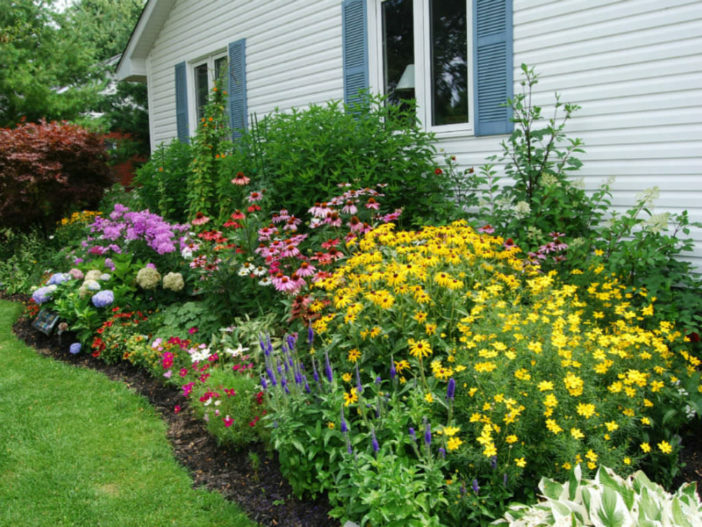 The best flower garden designs incorporate several types of blooms, including long-living perennials, short-term but beautiful annuals, seasonal bulbs, ornamental grasses, and vines. Before you begin your flower garden design, know how different garden plant types perform in the garden, what they can offer for color and texture, and their limitations. Whether dictated by your home’s architectural style or your personal preferences, your garden’s style can also help you set parameters for size and design. Different flower garden design styles lend themselves to different types of plants. For example, a contemporary-leaning landscape may be more rigorous in material selection and flowerbed shape, while a cottage-style garden encourages exuberance and a mix-and-match approach. Flowers can be arranged in beds of almost any shape and size, from expansive rectangles to petite corner beds. To get an idea of how your flower garden will fit into the rest of your landscape, use a garden hose to define the edges. Walk around the bed; see if you can access “plants” in the middle or need to include a path, and look at the proposed garden bed from every viewpoint. Don’t start too large. You can always begin with a small plot and expand it as needed. Once you’ve decided on your flower garden’s design, shape, and size, it’s time to put your plant research into action. Consider focal points, flower sizes, year-round interest, bloom time, and color combinations. Every garden bed, no matter how big or small, needs a focal point. Focal points give the eye a place to start before moving on to the rest of the flowerbed. That may mean anchoring your large bed with boxwood shrubs on the corners and a flowering shrub in the middle, or planting a mass of a single flower type in the center of a skinny border. You’ll also have to consider height before making plant selections. For example, if your garden is a border along the house, the tallest plants will need to go in the back but shouldn’t be so tall that they block windows or doors. If your flower garden design is an island, the tallest plants should go in the center. Some shorter plants also suffer when shaded by taller plants, so take individual flowers’ needs into consideration. Well-designed flower gardens put a premium on year-round interest and staggered bloom times. Evaluate both factors before selecting plants. You don’t want to create a garden full of color in summertime but bare in autumn. That’s another reason it’s important to combine different types of plants — shrubs that provide spring bloom and winter structure, fall-blooming bulbs, and summertime perennials, for example — in your flower garden design. Creating the best color combinations in your flower garden design can be tricky. A good place to start is the color wheel. For example, gardens planted in shades of the same hue — pink, to name one — are pleasing to the eye. Colors next to each other on the color wheel — purple and red — look good together, as do colors across from each other — purple and yellow. Foliage can also provide much-needed texture in the garden to add visual interest even when blooms have waned. When you’re arranging plants in your flower garden design, plant at least 3 (or any odd number) of the same kind of plant, either together or spaced apart. It’s a visual design trick that feels less jumbled than a one-only collection of plants. Hardscape elements, such as pergolas, trellises, and arbors, are great complements to flower garden design. If you’re crafting a bed that flows from front yard to backyard, for example, an arbor with a climbing rose is a good way to mark the transition from public to private spaces. Once you’ve decided on all the elements and the garden’s size, it’s time to prep the bed by removing any old plant material (including grass). You may also want to add edging to your flower garden, such as pavers or another material. Then it’s time to purchase your flowers and plant them according to your flower garden’s design. Any newly planted flowers should be well-mulched and watered regularly until the plants are established. Monitor your rainfall and supplement as needed, ensuring that your plants receive about an inch of water a week.